Mount AMPS-based items nearly anywhere with the RAM MOUNTS Small Tough-Claw Base with Double Socket Arm and AMPS Rectangular Adapter Plate. This base features the small Tough-Claw, which mounts to round, square, or oddly-shaped rails, bars, and tubes from 0.625 to 1.5" in diameter. It also clamps onto flat surfaces up to 1.14" thick. It connects to the AMPS rectangular adapter plate, which lets you attach RAM and other cradles with the AMPS hole pattern. The Composite Double Socket Arm for 1" Ball Bases from RAM MOUNTS allows for almost infinite adjustment and just the right viewing angle that you may be looking for. The unit has a socket at both ends that accommodates 1" ball bases. A single spring inside the arm opens the end sockets, allowing you to pivot the ball and socket connection. 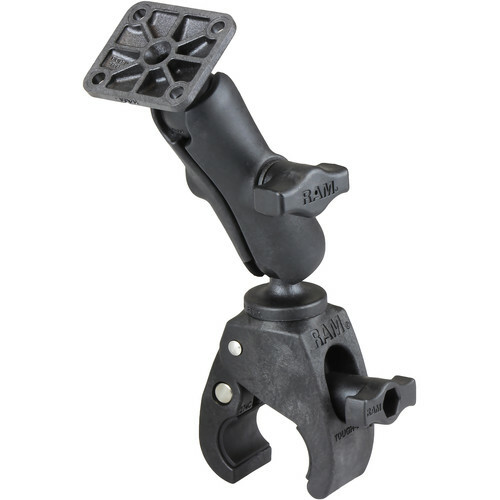 Complete or expand your RAM mount system with the RAM MOUNTS Small Tough-Claw with 1" Diameter Rubber Ball. This tool-free clamp lets you attach your electronics onto round, square, or oddly-shaped rails, bars, and tubes from 0.625 to 1.5" in diameter. It also clamps onto flat surfaces up to 1.14" thick. Designed for durability, the Tough-Claw is made from high-strength composite materials and stainless steel. It is designed for use with other RAM mounting components (sold separately). Box Dimensions (LxWxH) 3.701 x 3.543 x 0.472"
Box Dimensions (LxWxH) 7.244 x 5.039 x 1.26"